Hire the top 3% of freelance React Native developers. Toptal is a marketplace for top React Native developers, engineers, programmers, coders, architects, and consultants. Top companies and start-ups choose Toptal React Native freelancers for their mission-critical software projects. React Native developers need to have a particular set of skills to be effective. Teasing out whether a developer candidate is a good fit for your project can be a challenge without knowing the right topics to pursue. Toptal is a marketplace for top React Native developers, engineers, programmers, coders, architects, and consultants. Top companies and start-ups choose Toptal freelancers for their mission-critical software projects. Anna is a software engineer with over 15 years of experience in C++—focusing on distributed real-time financial applications. For the last two years, she has been working as the CTO of a startup, architecting the full-stack solution for the web and iPhone MVP, and developing all of the back-end processes and APIs in Node.js and Firebase, as well as implementing the majority of the front-end in Swift and Angular. Gabriel excels at development, design, and branding. He combines these skills every day to imagine, draw, and build amazing web sites and web applications, from the ground up to final deployment. Stan is a CTO and a full-stack engineer with 15 years of experience. He has spent the past seven years doing web and mobile apps. He's good at designing architecture and implementing agile development process. The technologies he's worked with include: Node.js, Elixir, Rails, AngularJS, React, React Native, Objective-C, iOS, Java, Android. He's also familiar with C++, Haskell, C#/.NET. He is an enthusiastic programmer and a great guy to know. Richard is a full-stack developer with a broad and versatile coding skill set. He helps small businesses and startups quickly with prototypes and ideas by building those things into reality quickly and efficiently. 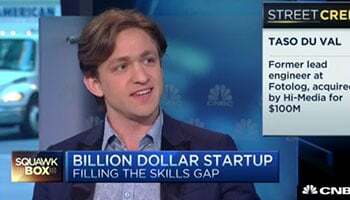 He has worked for 3 years at Goldman Sachs before moving to a hedge fund and then consulting for McKinsey Digital Labs. React Native is a library for rendering mobile applications on iOS, Android, and UWP. Using React Native, it’s possible (in most cases) to write code once and deploy to all available target platforms—which is probably why you’re looking to hire a React Native developer. Let’s dive into some React Native interview questions to help you in the process of assessing your candidate. What are React Native components? Components are the building blocks of a React Native application. React Native provides a set of components that map to the corresponding native components on each platform which the React Native developer can use. Some components can be used on all platforms (like View, Button, and FlatList) while others are platform-specific, as they map to native components that exist only on iOS or Android: For example, iOS does not have a hardware back button, so a BackHandler component for iOS would not make sense. What’s the best way to display items in a list, performance-wise? React Native offers a VirtualizedList component that provides virtualization out of the box. While VirtualizedList can be used directly, the more high-level FlatList (display items in a scrollable list) and SectionList (same as FlatList but with grouping and custom sections) implementations are fit for most use cases. Some things are important to keep in mind when working with a VirtualizedList, however. There’s no assurance that the internal state of the items in the list will be kept when scrolling the list: Based on the amount of elements and the level of scrolling, the list might dispose of some elements outside of the viewport. Those elements will be recreated from scratch based on props when coming back into the viewport. So, the developer needs to make sure that the item can be recreated based on props alone. It’s a good practice to make sure list items do not re-render if passed in the same props they already have. This can be accomplished by implementing shouldComponentUpdate in the item’s component, or alternatively inherit from the React.PureComponent class, which provides an implementation of shouldComponentUpdate that does shallow prop and state comparison. How do you style components in React Native? Note that while the syntax resembles CSS, it’s not CSS, and styling a React Native application’s components does not follow the same conventions. Notably, all properties follow the camelCase convention instead of dash-case (background-color becomes backgroundColor) and layout can be specified only using the Flexbox algorithm. How would you debug a React Native application? While running a React Native application in the emulator, it’s possible to access the developer menu by either “shaking” the device (by selecting the “shake” gesture in the emulator) or by pressing Command-D (iOS) or Control/Command-M (Android). The developer menu will display a “enable JS debugging” menu entry, among other things. After clicking it, it will be possible to browse to http://localhost:8081/debugger-ui with Chrome/Chromium, which displays the debugger. Log traces are visible by running react-native log-android for Android, and react-native log-ios for iOS, while the emulator is up. If using Redux, Reactotron is especially useful to see all API calls and actions dispatched. Our existing codebase is in Xamarin, and you would be helping to port it to React Native. What would be the issues to watch for? Unlike our other React Native interview questions, this may not apply to every project. But if it does, it’s certainly an important line of questioning to consider. React Native and Xamarin.Forms adopt the same approach towards making cross-platform applications: Both take a UI definition (virtual DOM or XAML) and transform it to native code. The development platforms they’re available on: React Native is available for Linux, MacOS, and Windows, while Xamarin is officially available only on Windows and MacOS. While React Native and Xamarin.Forms do conceptually the same thing, the abstractions they use are not directly compatible. For example, a component available on React Native might not necessarily be available on Xamarin, and vice versa. Also, the same abstraction is often implemented in different ways across the two frameworks: Take FlatList and SectionList on React Native, which map to their corresponding concept on both iOS and Android, and ListView on Xamarin.Forms, which conflates the two into one single UI component. If a React Native developer were to tackle a port from Xamarin.Forms, it would be greatly beneficial for them to have at least some experience with C#, and ideally some experience with Xamarin. What’s the relationship between React and React Native? React keeps in memory an internal representation of the UI (virtual DOM). It uses this representation to compute deltas in the visual appearance of the components on props/state changes, in order to make it possible to partially update the UI on data changes—thus avoiding the need for complete redraws. React Native sits on top of React and, where React would render the virtual DOM as an HTML document, React Native maps the virtual DOM to native iOS/Android components. So, while React is often used together with JSX in order to generate HTML output, React Native has its own set of tags that represent abstractions of native components. Those native components are what get displayed on the device in the end. Libraries that are often use to handle state (Redux, MobX) and most plugins that are not dependent on UI are used the exact same way in React and React Native, and most patterns/best practices that apply to React apply to React Native too. Highlight the major differences and tradeoffs between native development and mobile development using React Native. Hot reloading is a great React Native feature, allowing the developer to change the application code and see those changes directly in the emulator, with no need for recompiling/redeploying. While performance has been improving steadily over the last two years, React Native is still significantly slower than a visually equivalent native application, especially when the application makes heavy use of animations or has a complex UI. Some native functionality is not available for use directly from React Native, and it might be necessary to write modules for each target platform, in the target platform’s language. How does React Native behave across different platforms? React Native takes the virtual DOM, generated by React based on the interface definition—i.e. the result gotten from calling the render method on the application’s components. It then uses this to generate native code for each of the target platforms. That means that, for the most part, the developer doesn’t have to worry about platform-specific details and can rely on React Native outputting the right native code based on the situation. For example, if the developer adds a Text component, it will be transformed into a UITextField on iOS, and into a TextView on Android. The same goes for layout definitions: React Native uses flexbox, and that is translated as proper layout definitions specific to the target platform when the application is deployed. There are some cases where React Native does not provide an abstraction layer over native components or functionalities. In those cases, the developer will have to write a native module, in the target platform’s language. That is done by extending the ReactContextBaseJavaModule for Android, and by implementing the RCTBridgeModule in iOS. What are the different options available when it comes to handling state in React Native? As it is, React (and thus React Native) does not enforce any kind of global state management. The only patterns available to use for the developer are injecting state into components using props, which are meant to be immutable, and internal component state managed privately through the state property. There are several options available when it comes to global state management, the more widely used being Redux. If the developer is familiar with Redux on React, there are no changes for when it comes to using it on React Native. The behavior is exactly the same, as are the common patterns of use. Another available option to manage global state is MobX, which handles state using observables and bindings, the way Knockout.js and WPF do. While Redux follows functional programming paradigms—and is suited to that kind of programming style, for that reason—MobX can be easier to pick up for those coming from an object-oriented background. Both options are valid, and it’s important to consider the team’s composition before picking one or the other. Redux is often the choice preferred by those with a functional programming background, but it can be challenging to get up to speed with. MobX offers a flatter learning curve, but it might show problems when the application grows up to a certain size. There are other pieces of middleware for Redux that do not expose the concept directly—the most famous being React Saga—but it’s very important that your React Native developer candidate is comfortable with functional programming concepts like the above. What is middleware? How is it used in Redux? Redux middleware is a function provided to Redux by the developer (either imported from an external module, or developed directly) that intercepts all actions dispatched before they reach the reducers, potentially does some operations on those actions, and forwards them to the reducers afterwards. Middleware thus provides a hook that can be used to run custom operations on actions before they reach the reducers. This is important, as many libraries and extensions (e.g., the aforementioned redux-thunk) register themselves as middleware. A piece of middleware returns a Thunk, as it is a function that returns a function. Here, store is the application’s store, available from inside the middleware function. That means that store.dispatch is available from inside the middleware, thus making it possible to dispatch more than one action per action received—beware of infinite loops! Then next is a function that returns a function (which will dispatch the action) and expects an action as the parameter. The answers to these questions should give you an idea of how much a developer candidate is comfortable working with React Native. See also: Toptal’s growing, community-driven list of essential React Native interview questions.